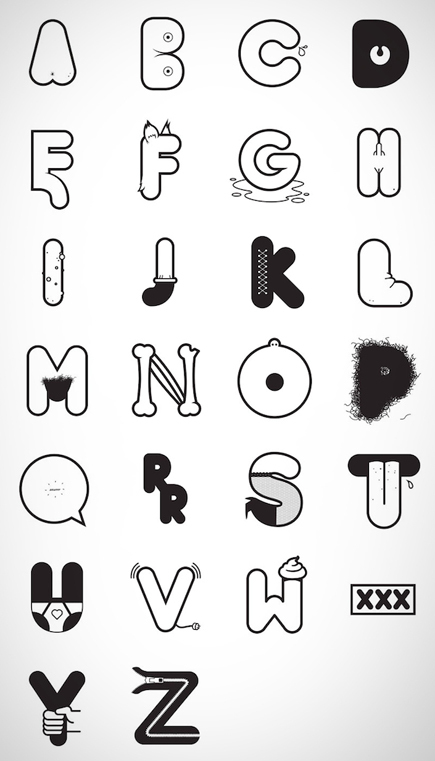 We think graphic designer Alex Merto's Effing Typeface is imaginative and hilarious. Via Looks Like Good Design. Whitespace launches a new edition of totebags in our series, "The Only..." The latest bags are inspired by the notion of celebrity with "The Only Game is Fame" and "The Only Freedom is Stardom". Made of thick black denim and screenprinted in white with a handy inside pocket, these totes are strong enough to carry all your stuff and can easily fit a laptop. As usual our totesbags are limited edition run of 100 per style, and are available through our website or at Kapok on Sun Street, G/F. 3, Sun Street, Wanchai, Hong Kong. Pick up one for yourself or for your friends for Christmas! Show us your love! This print is really witty and lovely. It's actually the 1st of three prints introduced by Remedy Quarterly under the series Words to Live By. Positive Posters is an Australian-based non-profit organisation that aims to raise international awareness for global social issues, with a firm "belief in the unrivaled ability of designers to create impact, communicate and spark revolutions". This entry to Postive Posters was submitted to them by our Whitespace graphic designer Andrew Kwong who put a focus on world hunger. Stay tuned for details of this year's annual poster competition winning entry. We all know Minnesota is the land of 10,000 lakes. Designer Nicole Meyer has decided to create a logo for each of them on a website called Branding 10,000 Lakes. It's a bit more ambitious than blogger Julie Powell's 2002 challenge to cook all the recipes in Julia Child's first cookbook, but we love the idea just the same. Meyer writes, "Lake logos have a tendency to be, well, fairly ugly. This project was created to rethink what they could be. One Minnesota Lake. One Logo. Every day. Should only take a little over 27 years to hit 'em all." Good luck and keep them coming! Jun 21, 2011 First Day of Winter. Doodle by Takashi Murakami, 2011. The enormously talented Coralie Bickford-Smith over at Penguin Books has just produced these lovely art-deco inspired book jackets for F Scott Fitzgerald's novels to commemorate the 70th annivesary of his death in 1940. To be released on November 4, the titles in the series include The Beautiful and Damned, Flapper and Philosophers: The Collected Short Stories of F Scott Fitzgerald,The Last Tycoon, Tender is the Night, and This Side of Paradise and most famously, The Great Gatsby. via Creative Review. Our studio Whitespace continues our series of "The Only..." tote bags with a two new versions for 2010. "The Only Luxury is Time" and "The Only Moment is Now" is silkscreened on thick black cotton canvas. Limited to 50 pieces each, these are available through our shop for purchase. Show Us Your Type has released their Berlin edition! We are pleased to announce that Whitespace will be working with this collective on their next location — Hong Kong! Become their fan on Facebook and watch this space for more details.